The “scratch and patch” repair technique I used to repair the small damaged area on both winch bases worked very well. I can’t tell where the repair was made on the port base. Though it still required five repair coats and two full coats over the entire base it still saved a bunch of work. For the last couple weeks we have been working on several projects as we continue to either further refine the Far Reach’s few systems or conduct routine maintenance. One project was the installation of a camcleat for the jib downhaul System, which is a separate article. The first varnish project was to repair some damaged varnish on the teak stays’l winch bases. The bases are about 4” tall and are varnished. On top of the base is a 2” thick bare teak pad that serves to raise the winch up enough so the drum is above the top of the coaming. Though we varnish the coamings and pads every four months, there was a break in the varnish on the top edge of each pad. Horizontal surfaces always receive more abuse than vertical surfaces so this damage was not a big surprise. 20 May 2016–The Far Reach, Anchored, Simpson Bay, Sint Maarten. The Far Reach at anchor in Simpson Bay, Sint Maarten waiting to be turned loose for the trip home. I spent 2 1/2 hours yesterday scrubbing the hull of the Far Reach in preparation for my upcoming singlehanded passage back to NC. I moved the Far Reach out of the lagoon this morning. I have provisioned with food, ice, water, and cleared Customs. With luck I’ll get underway this afternoon. That would put me near Virgin Gorda tomorrow morning. 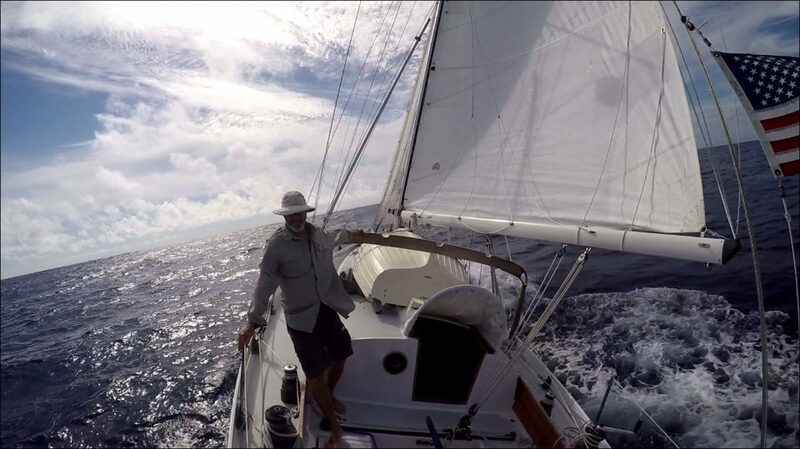 I can divert to the BVI in daylight should the halyard chafe issue not be solved. The winds are expected to be light for the next week. Could be a slow passage. Will have to see. inhave had a great trip this year. I have learned a lot. I have also gained tremendous confidence in the Far Reach. With luck, I’ll make landfall at Cape Lookout and 10-14 days.